These images were taken in the fall of 2012 in the Watson family’s area in Green Hill Cemetery. The stones were still in disarray on my last visit in March 2013, so it’s likely that they’ll look the same the next time I visit. 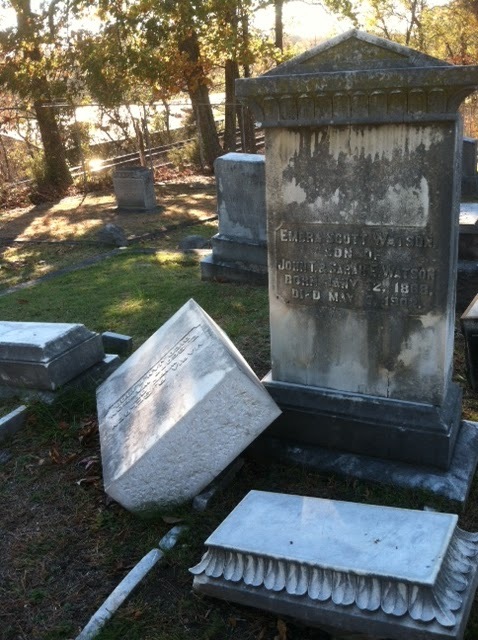 Whether the stones were knocked over by falling tree limbs, heavy wind, or vandals I’m not sure, but it’s sad, especially in a city-maintained cemetery. 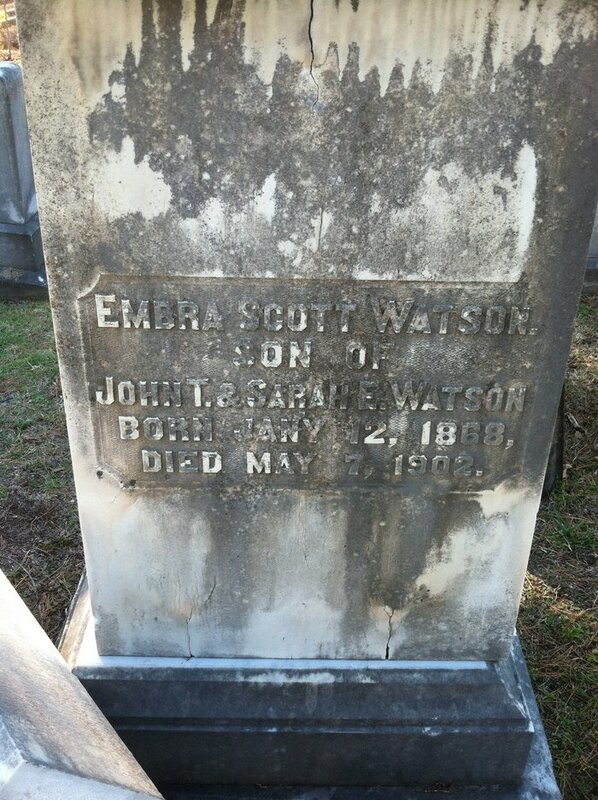 However, the focus of this post is the man buried in the grave marked by the upright tombstone, Embra Scott Watson. 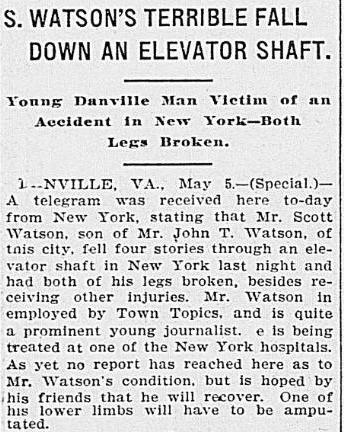 He was born January 12, 1868 to John Thomas and Sarah Edmunds Read Watson in Danville, Virginia. The 1870 census lists his name as “Henry E.S. Watson,” so either Henry was his first given name or the enumerator made a mistake. In addition to E. Scott, there were four other children in the home. Embra and the youngest child, Clement, were from John’s second marriage to Sarah. The other three children were from John’s marriage to his first wife, Nannie (Anne?) Green Read, who died in 1863. His father’s occupation on the 1870 census was “lawyer” but by 1880 John was in the insurance business. E. Scott, referred to in some of the news articles about his death as only “Scott,” attended Hampton-Sydney College, an all-male liberal arts school in Virginia. 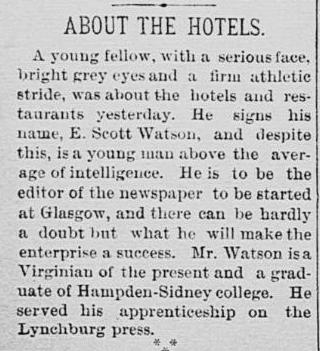 His interest must have been in journalism, because he worked at a Lynchburg newspaper and was the editor of a paper in Glasgow. He was described as having above-average intelligence and had a “firm athletic stride.” In 1897 he married Maria Selden, who died in 1900. 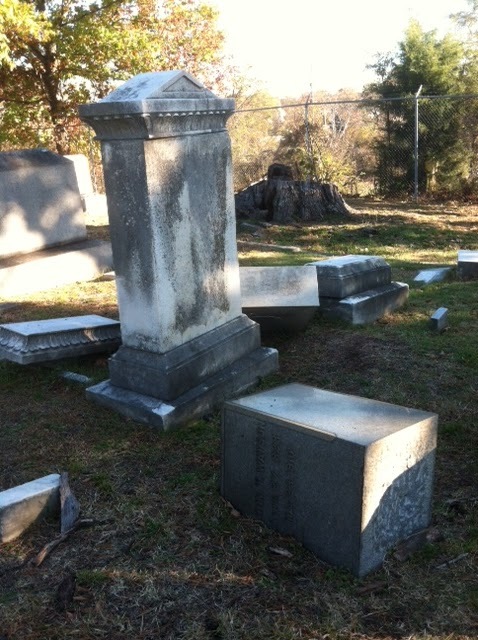 Her bright grave marker is seen in the first photo, having fallen off its base. From Maria’s obituary we learn that she and E. Scott had lived in New York City at least since 1897. At some point he was hired as a manager for the society paper “Town Topics,” which was more like a gossip paper than an actual news source. 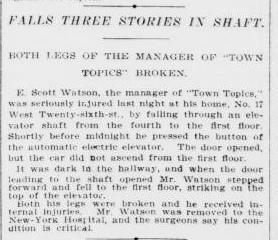 Scott was living on West Twenty-Sixth Street in May 1902 when he had the accident that cost him his life. Around midnight on the 5th, he pressed the elevator button wanting to go from the fourth floor to the first floor. In the dimly lit, or perhaps even completely dark hall, he didn’t notice when the elevator doors opened that the elevator hadn’t moved from its position three floors below. Stepping forward, he had nowhere to go but down, landing on top of the elevator car. Both of his legs were broken and he also sustained internal injuries. At least one of his legs may have been amputated while he was in the hospital. 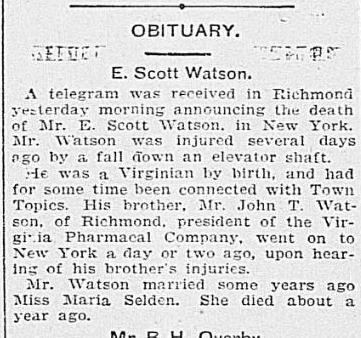 Scott’s brother, John, who was living in Richmond, Virginia, went to his brother’s side upon hearing about the fall and was in New York on May 7 when he died. Scott’s body was back in Danville by the 8th, where he was buried in the family square. *This entry was originally published in 2016.